An East Indian delight made from the dried unripe fruit of the mango tree. This fine powder is mixed with a little ground turmeric, and has a sweet-and-sour fruity bouquet and flavor with just a hint of resin. This pleasantly acidic and fruity flavor is used for its souring abilities and serves as a good substitute for lemon juice. 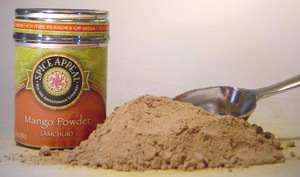 Primarily used in vegetarian dishes. Due to its tenderizing effect on meat, makes an excellent addition to marinades. Add to curries, soups and chutneys.